Hundreds of thousands of Shiite Muslims clambered aboard buses or began trekking homeward on foot Saturday at the end of Ashoura, a 10-day ritual to cleanse the spirit and scourge the body in honor of their founding saint. The high holy days in Karbala passed absent the slaughter of pilgrims witnessed in the years since the U.S.-led invasion nearly half a decade ago, despite two days of fighting that killed at least 72 people farther south and a series of attacks north of Baghdad. Fearing a spectacular attack on the masses of self-flagellating faithful who marched on the shrines in Karbala, Iraqi authorities flooded the city with 30,000 police and soldiers. Soviet-made tanks guarded approach roads. A relatively uneventful passage of Ashoura had been seen by U.S. and Iraqi officials as a rigorous test of the decline in violence in the country since Washington sent in 30,000 additional troops last year and many Sunni insurgents suddenly joined American forces in the fight against al Qaeda in Iraq. But militants did assault gatherings of Ashoura worshippers elsewhere. A rocket slammed into a busy market in the northern city of Tal Afar on Saturday, killing at least seven people who had completed the ritual and gathered there afterward, according to Najim Abdullah, the mayor. And two bombs hidden under trash blasted an Ashoura procession in Kirkuk, killing at least two, said police Brig. Gen. Burhan Tayeb Taha. Kirkuk, 180 miles north of Baghdad, has seen a rise in violence as militants have fled crackdowns elsewhere. And earlier in the week 20 people were killed in two suicide bombings against groups assembled for Ashoura in Diyala province, the still-violent and religiously mixed territory north of Baghdad. But in Karbala, provincial Gov. Aqil al-Khazali said 2 million Ashoura pilgrims passed peacefully through the holy city, home to the golden domed mosques of Imam Hussein and his half brother Imam Abbas. The festival, largely banned by Saddam Hussein and his minority Sunni Muslim regime, recalls the death of Hussein, grandson of the Prophet Muhammad, in a seventh century battle near Karbala. The combat defined the split between Islam's Sunni and Shiite sects. Men wearing black or white robes danced in circles and chanted as they swayed in unison. They pounded their chests, slashed their heads and beat their bloodied foreheads with the flat sides of swords and knives. Abbas Mohammed, wearing a black shirt and pants to symbolize his grief over Hussein's death, traveled from Baghdad to Karbala. "I came ... in defiance of terrorists and difficulties," the 41-year-old health ministry employee said. Naseer Mohammed, a 35-year-old Karbala resident, spoke with his face bloodied after he cut his forehead with a sword as part of the rituals. "I do not feel any pain despite the blood. The security measures were little bit excessive and they create delays and difficulties for us, yet they make us feel safer," he said. While there was no catastrophic attack during Ashoura, Sunni and Shiite militants kept up the steady, although diminished, level of violence Saturday in regions to the north. Bombs, suicide assaults, rockets and death squad murder left behind the corpses of at least 21 more Iraqis, including those killed in Kirkuk and Tal Afar. In Basra and Nasiriyah, south of Karbala, authorities put the final death toll at 72 when fighting ended Saturday after security forces stormed a mosque and ousted holdout members of the Soldiers of Heaven cult. The militants, some of whom reportedly have a number tattooed in blue ink on the back of their necks, seek to invoke chaos as a means of inspiring the return of the "Hidden Imam" - also known as the Mahdi - a descendant of Muhammad who disappeared as a child in the ninth century. 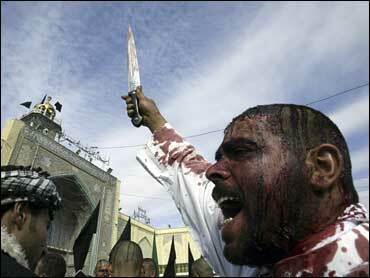 Shiites believe he will return one day to bring justice to the world. Basra police chief Maj. Gen. Abdul-Jalil Khalaf said at least 44 people were killed in Iraq's second-largest city - seven officers, two civilians and 35 gunmen - while dozens more were wounded and 100 gunmen were arrested. Aziz Khazim Alwan, the governor of Dhi Qar, of which Nasiriyah is the capital, said at least 28 people were killed in that city, 200 miles southeast of Baghdad. Alwan said the standoff ended when Iraqi security forces stormed a mosque sheltering followers of the group, discovering explosives and yellow headbands signifying allegiance to the cult. Alwan said the militants had targeted Ashoura worshippers but police had intervened to thwart the plot by the radical Shiite group. Last year the group mounted a ferocious attack after Iraqi security forces raided its stronghold near Najaf to foil an alleged plot to slaughter pilgrims and leading clerics during Ashoura. West of Baghdad, three suicide bombers targeted a police station in Ramadi, the capital of Anbar province and a former Sunni insurgent stronghold. Guards killed one attacker, but two others detonated their explosives at the entrance, killing at least five officers, authorities said.